My own Na'vi huntress Niftxavang (means 'passionate'). 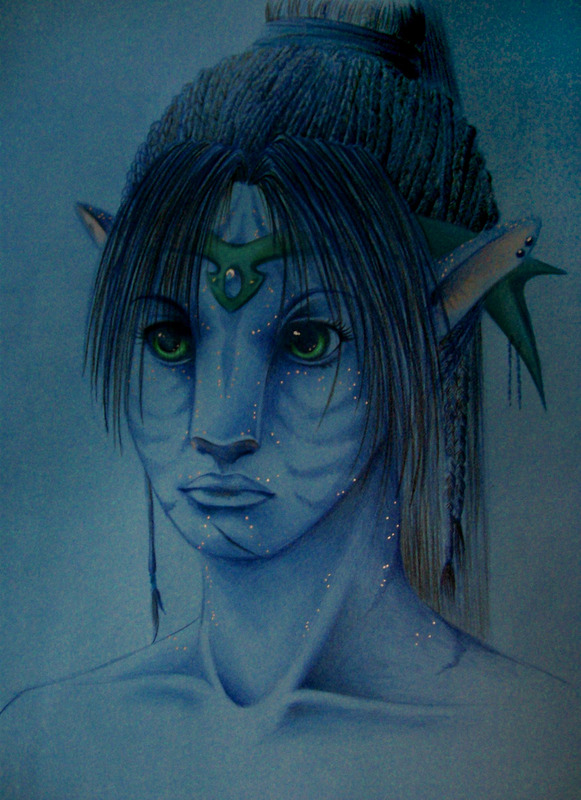 Blue, green, black and skin-coloured pencils on blue paper. Every time I'm curious if skill level 'Intermediate' is the right match or too overestimated. I realy don't have a clue. For some reason, I can imagine her as a top archer. ;o <3 Wonderful pretty white dots on her skin. They jsut make the Navi species pop out. They are truly beautiful people! Pretty green eyes, and the hair looks like you spent lots of time on it. Wonderful job. Nice work! I like the smooth shading, especially around the neck and the top of her breastplate. As for the skill level, I'd say this would rank for intermediate. If you're unsure, just say beginner and everyone will think you're modest :D You can't lose! And I'm not sure. It's mixed. Parts are filmed real persons and a lot of the film is digital animated.